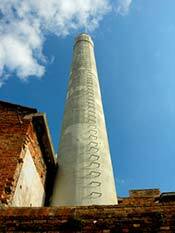 ABOVE: A glass factory's chimney on Murano. If you want a map that's more detailed than the Murano map in this Web travel guide, check your guidebook or see our review of Venice street maps that include the island of Murano. The Scibilias' 162-page book discusses the island's history, the history and techniques of glassmaking, tourist itineraries, the leading glass factories and workshops (arranged by type of production), and hospitality. The book is richly illustrated with glass photos, aerial pictures, and maps. It's well worth buying even if you aren't planning a trip to Murano but are interested in Murano glass.